Advanced Health Providers Julie Duggan, B. Sc. About Julie Duggan, B. Sc. Julie Duggan B.Sc. is a Canadian trained Osteopath who restores the body’s alignment through her deep knowledge of the body’s biomechanics. She applies Craniosacral, Visceral, Muscle Energy, and Myofascial Release Techniques to address restrictions and imbalances in the muscles, bones, connective tissue, and internal organs. By positively impacting the nervous, circulatory and lymphatic systems and restoring balance, Julie reduces inflammation and allows self-healing to occur. 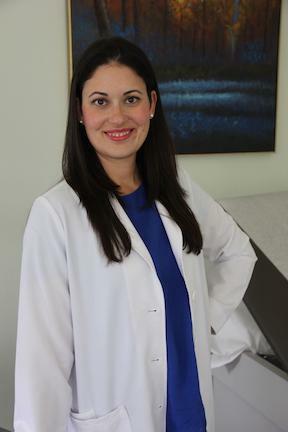 Born and raised in Montreal, Canada, Julie graduated with honors from the Collège d’Études Ostéopathiques of Montreal and received her Bachelor’s Degree of Science in Osteopathy from Wales University, Canada in 2006. In 2007 Julie moved to San Francisco with her husband and is now raising her three beautiful children. Julie is fluent in English, French, and Spanish. Julie is very successful in the treatment of acute and chronic pain due to injury, poor posture, overwork, hormonal imbalance and stress. She specializes in Digestive Disorders, Women’s Health and Chronic conditions triggered by stress. With gentle manipulations of the skull, spine, sacrum, and targeted organs, Julie balances the nervous system and restores blood blow. She stops inflammation so healing can finally occur. Julie optimizes conventional and natural treatments by allowing better organ and glandular function, increasing medication and supplement absorption, and helping patients overcome stress patterns that maintain chronic conditions. Julie’s ultimate goal is to find the root cause of symptoms and enhance the self-correcting potential of the body. She does not perform high velocity adjustments or prescribe medication as many American-trained Osteopaths do. She instead uses her gentle hands-on techniques to kick-start healing and drive effective change for each patient.